American Experience - "Dinosaur Wars"
“Dinosaur Wars” debuts tonight as a part of the PBS American Experience series. It will air at 9 p.m. Eastern and Pacific, 8 p.m. Central and Mountain in most markets, but you should check local listings. The story of Edward Cope and O.C. Marsh, two men who began as friends, then became enemies over something as seemingly inconsequential as the discovery of dinosaur bones, is one of those quintessentially American tales that, nonetheless, isn’t widely known. The terrific book The Bonehunters’ Revenge, by David Rains Wallace, gets at some of what makes the story so fascinating, but this is a Paul Thomas Anderson movie just waiting to happen, a story of outsized personalities in outsized conflict over things that have been dead for millions upon millions of years. There’s treachery and backstabbing and people blowing things up and men smashing fossils with hammers, all the better for no one else to find them and get credit for the discovery. As renowned paleontologist Bob Bakker points out in the new documentary “Dinosaur Wars,” debuting tonight as a part of PBS’ American Experience series, there were enough bones for Cope and Marsh and a dozen others to have discoveries for years. Instead, the two men drove each other into ruin, over a hatred that took on a life of its own. The greatest flaw of “Dinosaur Wars” is that it’s told in the now staid, traditional PBS documentary format (a format that’s used particularly often for histories). Photos and paintings of the past are accompanied by sonorous voiceover and sound effects meant to approximate the time. Occasionally, we’ll hear from a letter or period-appropriate document, usually read by the narrator. Talking heads will pop in from time to time to offer perspective and opinion. It’s a format that’s easily watchable, but it’s also a format that’s not horribly challenging to the audience, and it’s part of the reason PBS seems to give so many casual television viewers the hives. It wants to tell you a story (in many cases, like this one, a very interesting one), but it’s doing so in a way that constantly reinforces that you’re learning something. Instead of making the story come alive, it’s content to sit back and just tell you what happened. But it’s not as though there’s anything wrong with that if the material is strong enough, as it is here. Cope and Marsh are fascinating characters, each just different enough from the other to drive each other a little nuts by mere proximity. 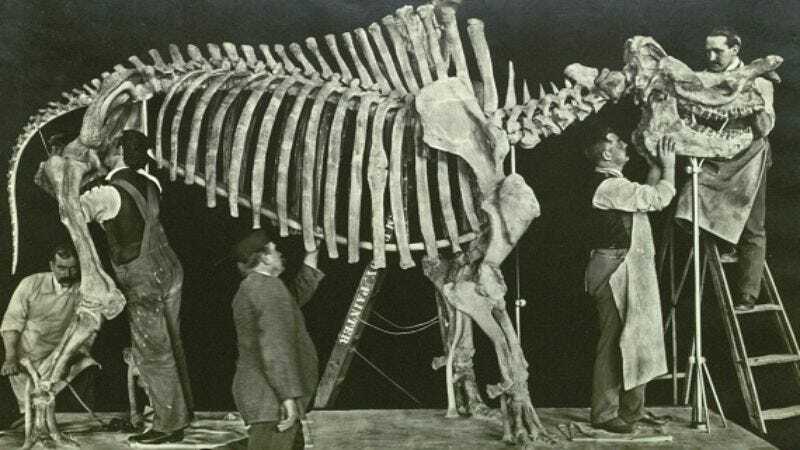 The era, too, is fascinating, as the discoveries of long-dead prehistoric beasts ignite a kind of scientific fervor in the American mind. Now, finally, there’s a field where Americans can not only compete with Europe, but best Europe, which simply doesn’t have the same caliber of fossils. Combined with the way Darwin’s theory of evolution was taking root at the time, it created an exciting opportunity for the United States to be at the forefront of scientific discovery. (Darwin himself wrote to Marsh to praise the man for his work in laying out the evolution of the horse, using the fossil record.) And on top of it all, there’s still something exciting about the notion of dinosaurs, about giant reptiles that roamed the Earth millions of years ago and then all disappeared, leaving behind only their bones. It’s hard science, but it’s also something that can set the mind of a 5-year-old child racing with wonder. Marsh, a Yale professor who used the discovery of prehistoric bones as a way to wrangle himself into a position of political power, mostly so he could keep Cope down, begins life as a part of a world of “gentleman naturalists,” a place where everyone is very conscientious of each other’s feelings and makes sure to not tread on each other’s toes when making discoveries. It’s doubtful this world actually ever existed, but Marsh certainly seemed to believe in it as a sort of Platonic ideal of how the natural sciences should be carried out. When he discovers a dinosaur in a quarry in New Jersey, a skeleton that kicks off the country’s fascination with the beasts, he’s only too happy to show the place of discovery to his friend, Cope. But Cope has ulterior motives and makes a deal with the quarry owner to send all future discoveries to him and him alone, a business deal that violates Marsh’s sense of science as a gentleman’s game and kicks off the bitter rivalry between the two. Marsh is a loner, living in a rambling manse in New Haven, Conn., and using his ties to the university to finance ever-more elaborate expeditions into the dangerous American West to find grander and grander specimens. He’ll return to New Haven to show off his discoveries and entertain, but his truest love is the pursuit of new discoveries, leaving him without a family for all of his life. Cope, meanwhile, is capable of great tenderness toward his own family and a pacifist Quaker who refuses to carry a gun when he ventures into hostile territory alone in the immediate wake of Custer’s loss at Little Bighorn. But he’s also an irascible man, prone to fits of anger, particularly when directed at Marsh. The two’s competition drives most other paleontologists, including mutual friends, out of the field, and they take to finding any means necessary to lock each other out of new finds, right down to smashing up bones they can’t immediately cart away from the dig. But all of that is one of those things that’s a natural problem with the one-hour TV documentary format. And if the story is strong enough, those concerns can usually be washed away. The story here is definitely strong enough to keep viewers watching, propulsive in a way this kind of TV documentary-making rarely is. By the time Cope and Marsh are driving each other to early graves, both of their careers and fortunes ruined, the story has taken on a kind of tragic heft, and virtually none of it is due to the filmmaking, which stays in the traditional, safe realm it always exists in. What happened here was sad enough on its own to give this story the power it needs to transcend the problems that come from trying to fit it into an hour and into this format. But do please bring on that movie and very soon.